BACKGROUND: Costimulatory blockade of T lymphocytes with the CTLA4-Ig fusion protein abatacept could be an effective treatment for the immune-mediated neuroinflammatory disease relapsing-remitting multiple sclerosis (RRMS). OBJECTIVE: To evaluate efficacy and safety of abatacept in RRMS. 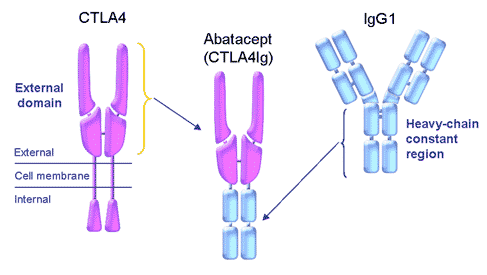 Abatacept is a fusion protein composed of the Fc region of the immunoglobulinIgG1 fused to the extracellular domain of CTLA-4. In order for a T cell to be activated and produce an immune response, an antigen presenting cell must present two signals to the T cell. One of those signals is the major histocompatibility complex (MHC), combined with the antigen, and the other signal is the CD80 or CD86 molecule (also known as B7-1 and B7-2). Abatacept binds to the CD80 and CD86 molecule, and prevents the second signal by CD28. CD28 is the receptor for CD80 (B7.1) and CD86 (B7.2) proteins. When activated by Toll-like receptor ligands, the CD80 expression is upregulated in antigen presenting cells (APCs). The CD86 expression on antigen presenting cells is constitutive (expression is independent of environmental factors). CD28 is the only B7 receptor constitutively expressed on naive T cells. Association of the TCR of a naive T cell with MHC:antigen complex without CD28:B7 interaction results in a T cell that is anergic. Without the second signal, the T cell can’t be activated. How in this study it is clear that without pwMS, the trial can’t be completed. This arthritis drug was used in MS in an academic study from Harvard and other universities around the USA. This study was stopped because it failed to recruit. This is a problem with academic trials, where the funding may be limited-notably time limited and if you don’t recruit quick enough then you run out of money. Although a company produced the drug the study was funded by public money and so when the money ran out, I guess the company did not keep the study going. This is a real problem and we have had similar problems where despite pwMS making the right noises, enough people don’t sign up. It may be because we have set an inclusion criteria that is difficult to meet, maybe we don’t have enough of the people required in their patches. However, I suspect in this one, the difficultly maybe that it was a placebo-controlled study. If you can get access to treatment why would you want the risk of getting nothing? Maybe they took a peek at the results as some interim analysis after half the patients were recruited and determined to carry on was futile. They found that there was no hope of success, but based on a 6 months imaging they failed to find any positive effect. So CTLA4-Ig in MS bites the dust. Many years ago we had a look at CTLA4-Ig in EAE and it could certainly inhibit EAE, well that was my memory. So I was abit disappointed ,when I read the news of clinical failure. Croxford JL, O’Neill JK, Ali RR, Browne K, Byrnes AP, Dallman MJ, Wood MJ, Fedlmann M,Baker D. Local gene therapy with CTLA4-immunoglobulin fusion protein in experimental allergic encephalomyelitis. Eur J Immunol. 1998; 28:3904-16. So having had a look at the paper again, we did indeed show CTA4-Ig could inhibit EAE. However, we showed that this drug was much more effective when we delivered it directly into, or produced it via gene therapy in, the brain. If you were activating a naive T cell to make a self-reactive primed cell we argued that you could do this systemically with an infusion to target this event in the lymph glands. But as this event has already occurred in disease the site where the T cells would become activated would be in the brain, behind a blood brain barrier that would block entry of antibody. Therefore by delivering it into the CNS it would work…which it did. Now you wouldn’t go for multiple injections in your brain but you could make a steady production using gene therapy. This approach did not catch on as the early gene vectors were immunogenic and caused a anti-viral gene vector response. Some idiots did not recognise this gave a load of virus (not-MS) to someone and the site where the virus ended up was destroyed…it was too late to do a liver transplant and that killed off gene therapy for a long time. Anyway back to our work, the CTLA4-Ig was much, much less effective when delivered systemically (as in the human study here). In the animal experiments we timed our delivery so that neutralising responses would not be an issue, as we would have an answer before one formed. Likewise, we showed that blockade of CD80/CD86 with blocking antibodies which is doing the same as CTLA4-Ig was not that great, in contrast to that reported in a Cell paper by the reviewer of the our paper. Maybe it was the torrid time we had getting the manuscript past the reviewer because of these results disagreeing with a Cell paper that made use give up the ghost or maybe because we moved away from lab with expertise and importantly the safety equipment required for the viral work. However, in contrast to that obtainable with other agents, in hindsight, the results of systemic CTLA4-Ig protein are pants, compared to that we can achieve with other agents, which can stop disease completely. We never tried to see if it would inhibit relapsing disease. It is also interesting that another Harvard group showed that susceptibility to CD80/CD86 blockade was strain dependent, which would not give me confidence that this would work in the outbred human population. Indeed it said “Considering that humans are outbred, these results raise the possibility that different individuals may have distinct requirements for costimulatory molecules in the selection of an autoreactive repertoire and in the induction of autoimmune disease. These genetic differences in the requirements for costimulatory molecules may have profound effects on the efficacy of B7-based immunotherapies currently being investigated for the treatment of human autoimmune diseases and other immune-mediated disorders”. I guess it was known by the authors that you don’t need CD28 to get EAE. People reading this new manuscript will be “thinking rubbish animal models”. Does this provide yet more evidence that we need to take a step back and take a critical look at the animal data, being used to support clinical trials. Maybe the slight diminution and delay of EAE is not enough to cut the mustard. Unless we get some quality control into what a real positive result is about to show something working or not working, we will continue to get irreproducible data published day in and day out. However, how do you change this practice when the perpetrators are the so called “World Leaders” who are setting a bad example. Why..there is nothing like ugly data to spoil a nice hypothesis. T cell immunotherapy that has failed in MS. Indeed do we have any evidence of T cell immunotherapy that has succeeded in MS? And from what I understood then CTLA-4-knockout mice are in unable to stop immune responses, and develop a massive response lymphocyte proliferation? Yes that is because CTLA4 is a negative regulator of immune response so if it is not there the immune system can proliferate. CTLA4-Ig blocks CD80 and CD86 which is needed to stimulate CD28 a positive regulator of immune response.